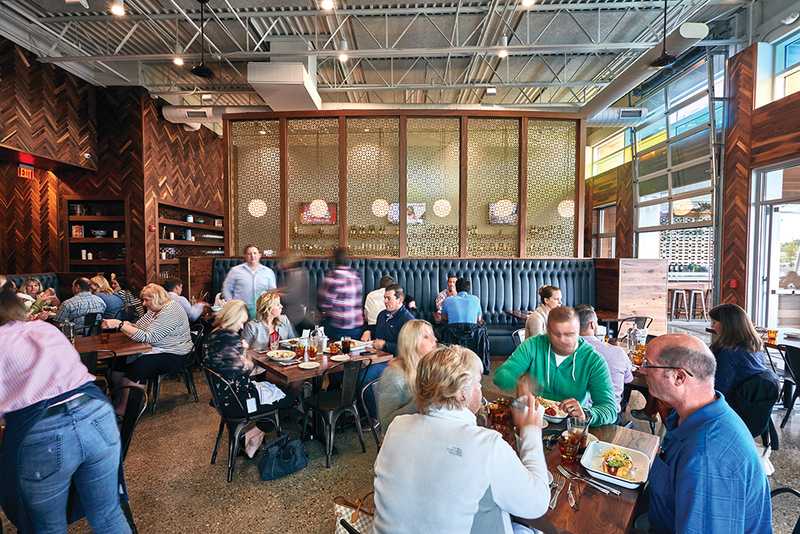 Senate brings OTR cuisine to family-friendly Blue Ash. Senate’s Blue Ash location makes no attempt to mess with a solid formula. 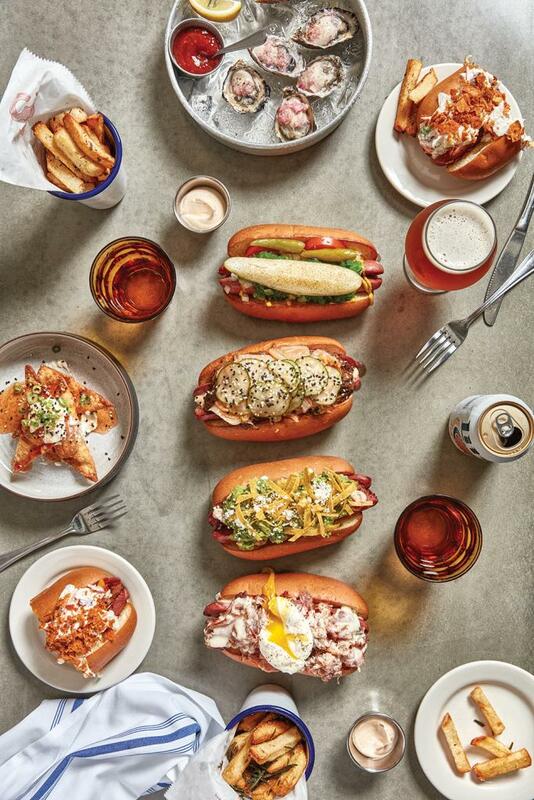 If you already like their place in OTR, you know what to expect: well-made, inventive comfort food, with a focus on fancy hot dogs (made locally by Avril-Bleh & Sons). A few of the menu’s puns have been swapped—Sonic the Wedge-Hog is now Wedge of Allegiance—but the salad is the same. Located in the sprawling Summit Place complex in Blue Ash’s Summit Park, this iteration of Senate trades urban conditions for suburban ones. Instead of the long wait to be seated at a cheek-by-jowl table during heavy dinner traffic, you circle a string of parking lots looking for a free spot. The thumping bass from cars on Vine Street has been replaced by the shouts of children playing on a space-age teeter totter in the playground outside. Inside, the dining room is airy and spacious, with a kind of upscale Old Hollywood cabana feel that is particularly pleasant when the weather is nice and the huge sliding doors are open to the patio. And Blue Ash brings back Sunday brunch—discontinued after a brief OTR appearance in 2012. The aforementioned salad—A Wedge-end In Its Own Time, if I were writing the menu’s puns—demonstrates why Senate has thrived for so long. They take a comfort food classic, and keep it comfortable, but also awake and alive with little surprises. The buttermilk dressing is a light green from being blended with tarragon, and its delicate anise-tinged flavor goes beautifully with the house-made croutons, lardons, and charred corn. The salad, for my money, is one of the best in the city—surprising, but not so wildly inventive that the satisfaction of the original is lost. Throughout its menu, Senate works its modest but reliable magic with smart tweaks and high quality ingredients. Poutine, on the streets of Montreal, usually comes with cheap brown gravy. 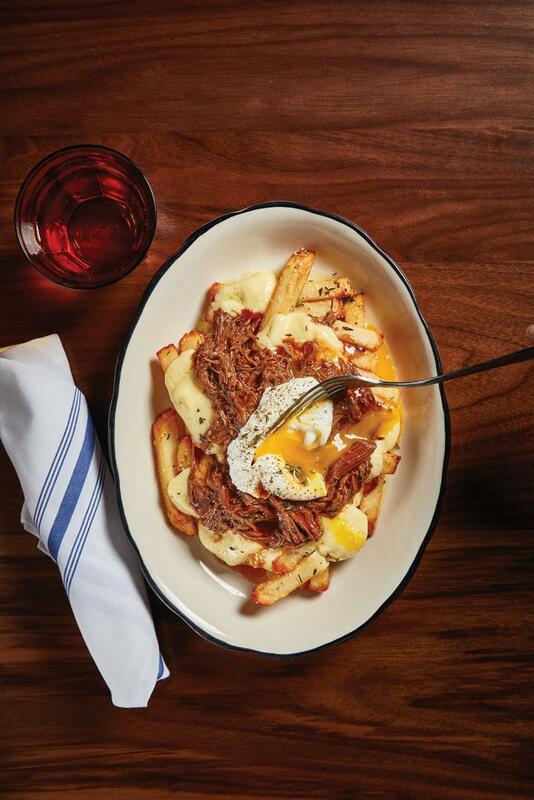 Senate has elevated it with béchamel and a dollop of creamy shredded short rib. I somehow miss the textural quality of the rubbery cheese curds they use in Montreal—Senate’s higher quality local curds melt on top of the fries. Most people come to Senate for the fries and hot dogs—and it shows. The more unusual menu items (marrow bones) and the more expensive ones (scallops) were not all that impressive. My advice: stick with the sides and the dogs. The hot dogs are big enough to share and, with a few added appetizers, make a satisfying meal. My favorite is the Korean, topped with more of that short rib and kimchi. Senate makes the Korean cabbage ferment in house, and wisely tones down the spice so you can taste the other flavors: the cucumber pickles; the soft, slightly sweet brioche bun; and a painterly sprinkle of black and white sesame seeds. If anyone ever asks me, “What kind of hot dog could possibly be worth $11?” I’ll show them a picture of this one. The croque madame is a goopy, salty, creamy delight, the dog covered with shreds of black forest ham, béchamel, and a runny poached egg. You can also go traditional with a Chicago dog, or try the rotating dog of the day. (Ours was Mexican-inspired.) My only hot dog disappointment was the Lindsay Lohan—covering an already soft, sweet bun with caramelized onions and goat cheese (with not enough bite from the arugula or the balsamic dressing) resulted in something squishy and sugary that felt more like dessert than a hot dog. Luckily, like Hollywood’s it-girls, things change fast at Senate. I’m sure more inventive hot dog drama is on the horizon. Senate isn’t the best place for vegetarians, but decent options are available. Sub in a veggie dog for two of the regular dogs, or try the sweet potato falafel, a solid dish, blisteringly hot with sambal oelek chili paste and intense notes of parsley and garlic. 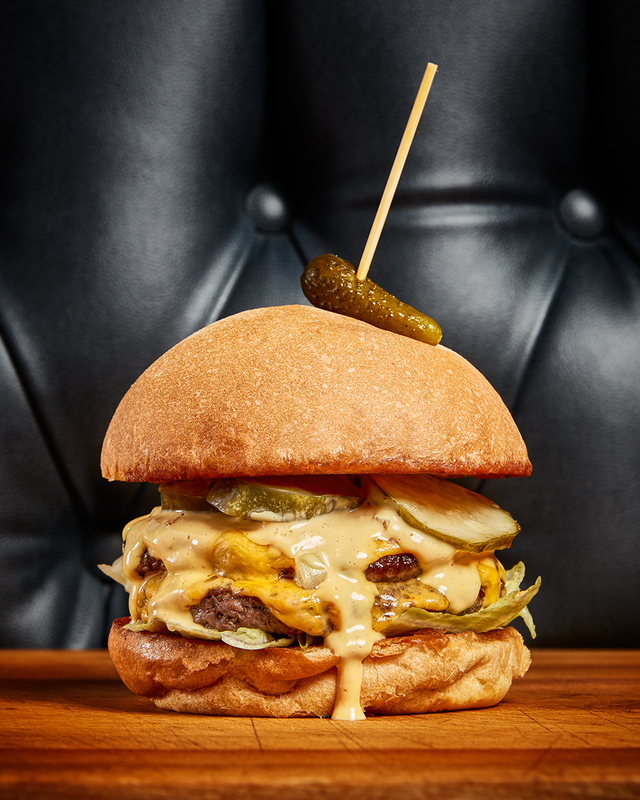 The Cleo McDowell burger, a two-patty beauty with American cheese, special sauce, and housemade pickles. My one criticism of Senate would be that in the desire to be extra satisfying, they hit certain buttons too hard. I wouldn’t have minded a bit more restraint in the mussels charmoula—which is a great dish, a spicy, cumin-y cousin to the bouillabaisse at Abigail Street (also one of Daniel and Lana Wright’s restaurants). But did the grilled, already oily bread need to be slathered with aioli before we dipped it into a creamy broth? It happened again with dessert. After a whole meal of creamy, fatty tastiness, when the bread pudding came out, I couldn’t really handle a huge piece of soft, gooey toast with caramel. 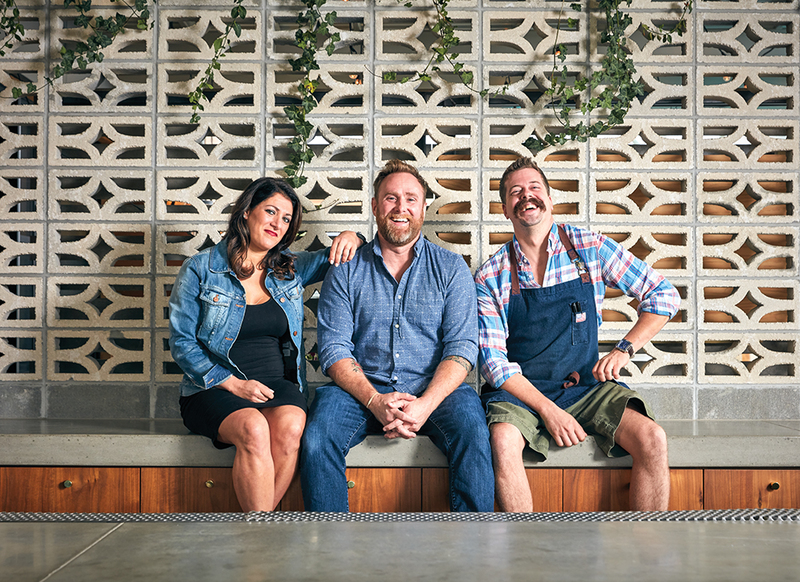 At Senate, the menu is a kind of State Fair of deliciousness, and they bring it all out to your table. Too much comfort food, as I’m sure most of us know, will eventually make you uncomfortable. Still, order smarter (and lighter) than I did, and you will leave Senate completely content. At this price point, few other places in the city deliver as consistently, and I can’t think of a better place to bring diners with many different levels of adventurousness, from hipster cousin to visiting father-in-law. During one of our meals, the server—friendly and knowledgeable—delivered the bad news that local brewery Blank Slate had closed its doors. My friends and I shared some of the last of their beer in the city. (A number of Senate’s 24 taps feature local brews.) We talked about how hard it is to survive in today’s food and drink landscape, even when you have a good product. To become an institution, as Senate has, you also have to do something that no else is really doing. And even with two locations, Senate is still singular. Every bit as good as the original, with more space to stretch out.